While up in Northampton last week, I stopped in to see Gaziano & Girling’s new workshop. And Tony was kind enough to show me round. There aren’t many shoe makers in England that combine a bespoke and ready-made business in the way that G&G now does, both responding to client’s requests and designing new collections for wholesale and private-label work. These two sides of the business inform each other in some interesting ways. For example, working with clients on their ideas for bespoke can create inspiration for a ready-made collection. And while some other brands get input from clients through special orders, it is not the same proportion or relationship as that gained by bespoke. You can see some of the slightly more daring G&G bespoke ideas here, from stingray through to laser designs. These are all waiting to go to Japan with Dean for a trunk show. Bespoke shoemakers without any manufacturing, on the other hand, have a slightly narrower perspective. For example, they often have to use merchants for sourcing leather. A business with bigger volume can afford to order its own leather in bulk, and deal with the tanneries directly. “I think it also teaches you how much tolerance men have for the fit of their shoes,” says Dean. 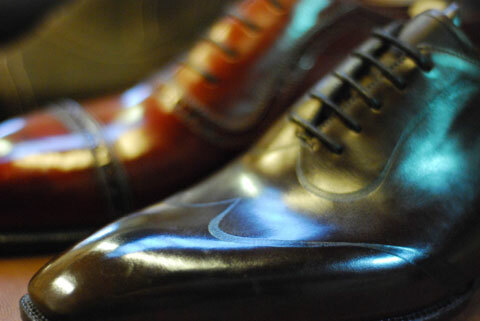 “Bespoke tends to focus quite narrowly on how a man’s shoes should fit, according to fixed ideas or a golden formula. But if you watch a man try on sizes, you realise how much personal preference plays a role. You remember there’s a person on the other end. And of course, bespoke shoes inform the quality and design of ready-made, as these pictures and Gaziano & Girling’s burgeoning reputation attest. Characteristic design features include the peaked toe-cap and aggressive waist treatment. Finally, a quick tip from Dean on polishing: try mixing the water you use with a little surgical spirit, in around a 4:1 ratio. Brings out the shine just lovely. You can follow the discussion on Gaziano & Girling: The benefits of both sides by entering your email address in the box below. You will then receive an email every time a new comment is added. These will also contain a link to a page where you can stop the alerts, and remove all of your related data from the site. As I understand it, surgical spirit is a mix of methanol and ethanol. Here in the States, we can normally get only isopropanol, commonly called rubbing alcohol. So, Simon–can we use rubbing alcohol instead of surgical spirit? Horatio, Simon, you can certainly get ethanol, at least in the US. It’s sold both at pharmacies and paint departments, as ‘denatured alcohol’. Denaturing simply means that they put a tiny bit of something in it that makes you sick as a dog if you drink it, so it is not taxed as liquor. Simon – where can one buy Gaziano & Girling’s wonderful creations in London? Their website shows an address on Savile Row, but it does not to be there on the real Row… Advice appreciated. Hi TMR – they are there on the Row, in the basement of No12 with Chittleborough & Morgan. It’s just a display of styles – G&G is made to order or ordered from their stock lines (or bespoke of course), so you contact Tony or Dean through their website and make an appointment to meet them there, be measured and pick your style. When will we see an article on G&G in The Rake?